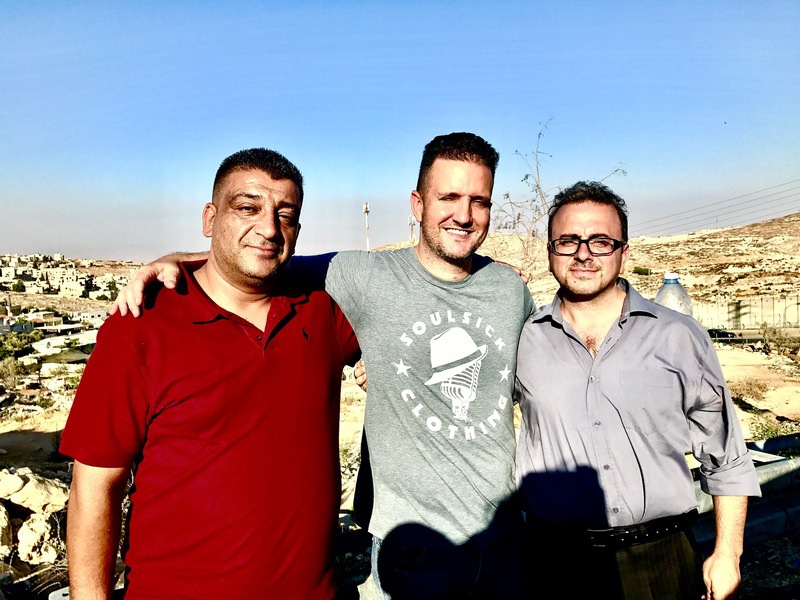 This article is part two of my Israel–Palestine trip. Please make sure to read the Israel chapter HERE first, they should be read in order to get the full story. 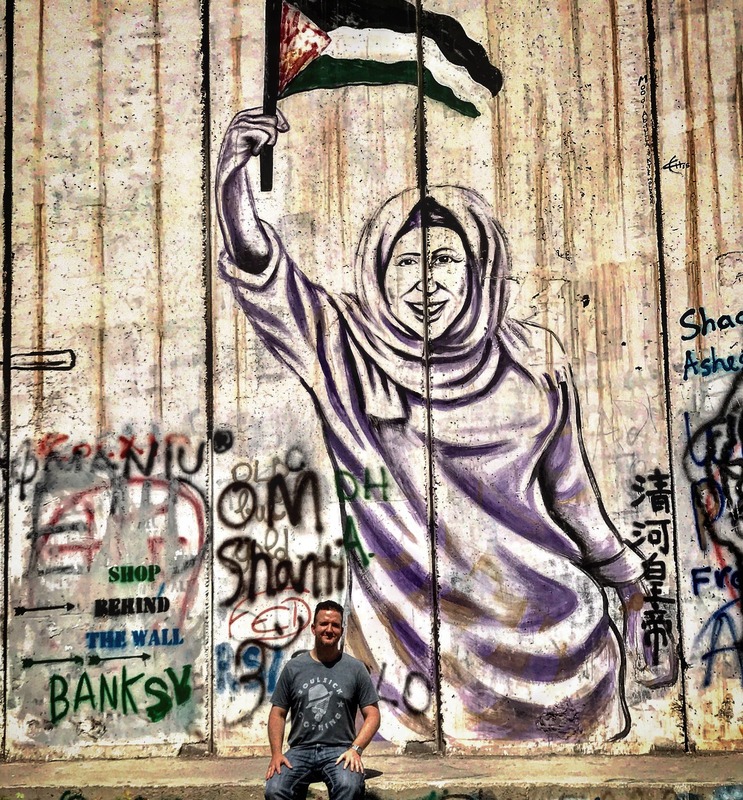 Palestine was part of a last minute, whirlwind, weekend trip; literally planned the day-of. 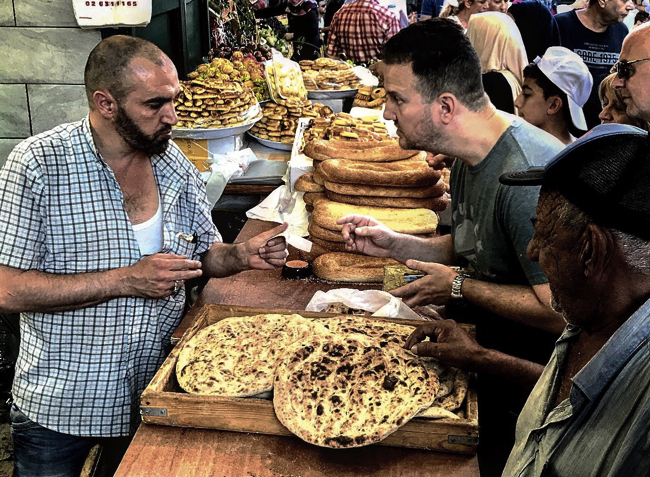 As I admitted in my Israel article, I was pretty ignorant on the history, tension and even location of Palestine and Israel, so I was flying by the seat of my pants. 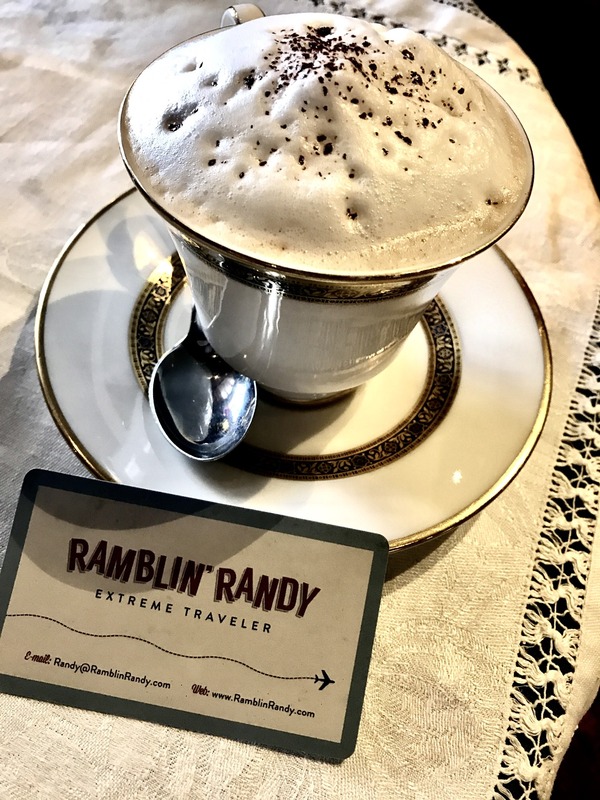 In fact, it wasn’t even until I was boarding the plane to Europe, that a good friend and fellow traveler reminded me that Palestine was right there, and that a tour of The West Bank was essential. I was excited I’d get to add another pin to my map and couldn’t help but shutter in horror realizing that I was this close to missing Palestine. 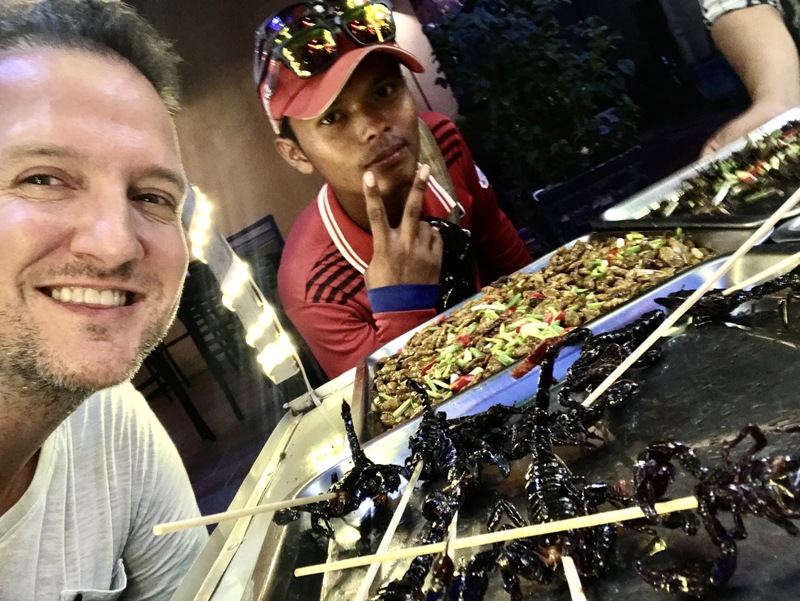 But I didn’t miss it…and it was incredible! 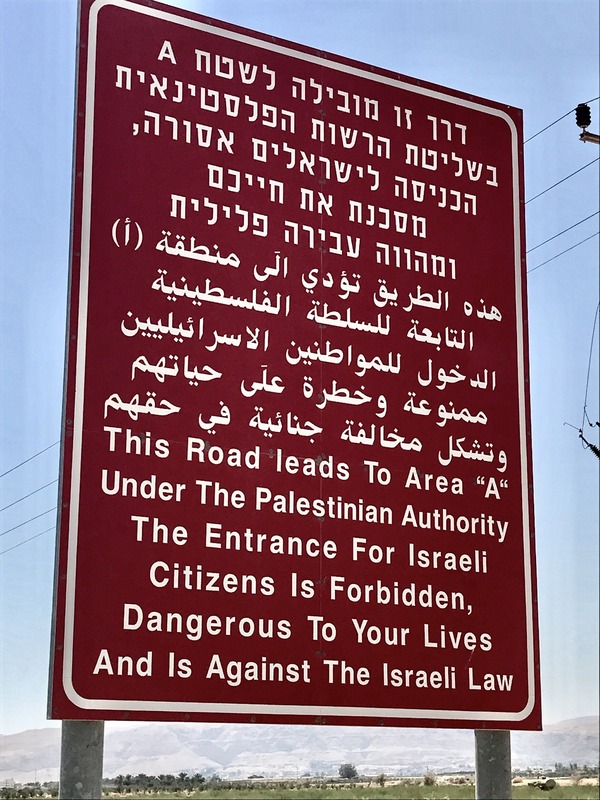 One of the things that blew my mind–and something I’m still trying to wrap my head around–is the relationship between Israel and Palestine, specifically its citizens and the different rules they have to abide by. For example, my guide Tamer, a Palestinian, couldn’t even pick me up at my hotel because he isn’t allowed to set foot in Israel. I found that strange (and tragic), but soon realized that was just the tip of the iceberg. 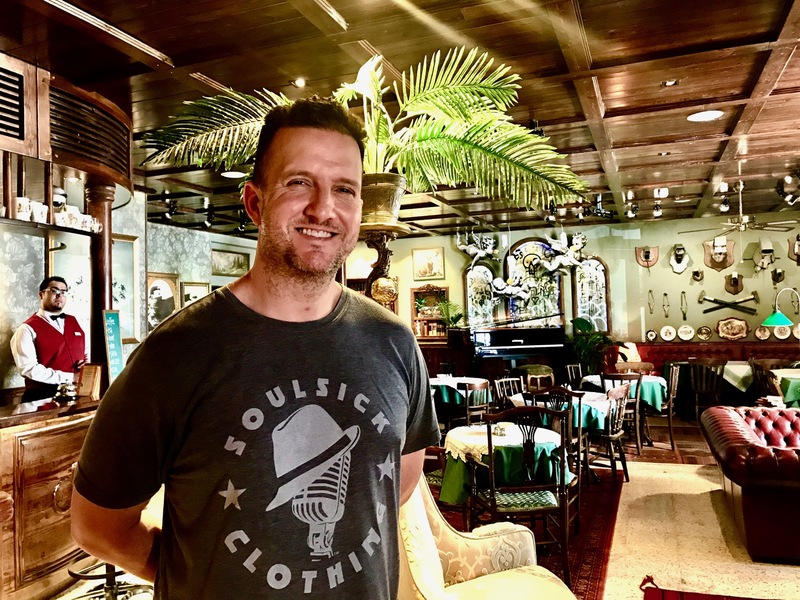 I’d soon learn there were many, many barriers separating the two nations and its people–even a separate highway system for the two nationalities–a weird kind of apartheid of some sorts. And I’d be lying if said I understood it all. Tamer did his best to answer all of my questions. It was like he was my dad and I was a four-year-old, asking question after question, but not really absorbing or comprehending the answers fully. I left Palestine more confused than when I arrived. There it was, in black and white…well, “maroon” and white. Actually getting “in” to Palestine was interesting. As I mentioned, my guide Tamer is not allowed into Israel, so he arranged for an Israeli taxi to pick me up at my hotel in Jerusalem. The taxi driver then took me into Palestinian territory, where I’d leave his car and get into Tamer’s. Once again, so many questions; I really didn’t know what was going on. 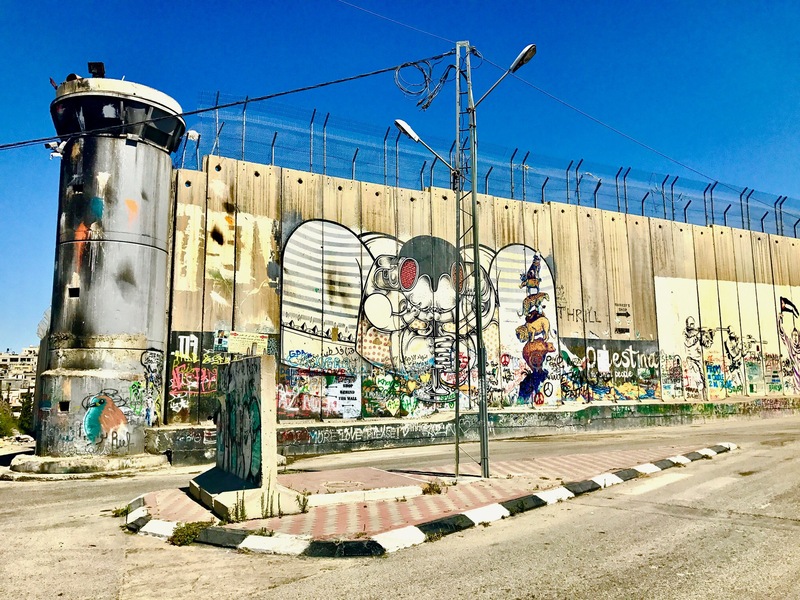 For instance, when we actually crossed in to Palestine: there was no stop for a checkpoint, no one looking at my passport, no line or wait, no border control. We just kind of “drove in,” past some fences and a structure that looked like an official border office–but it was unmanned. I remember asking, “Did we just enter Palestine?” I was very confused. 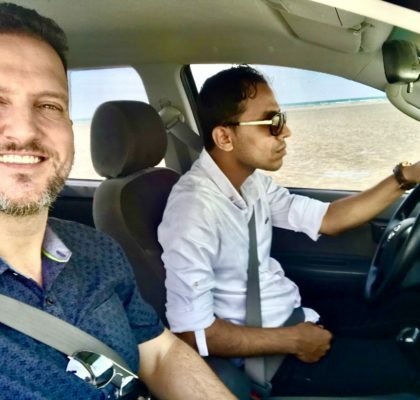 After driving through the border, the taxi driver pulled over on the side of the road and not less than two minutes later Tamer and his car showed up, and I was “exchanged.” Tamer and I shook hands, exchanged quick pleasantries, and we were off. We had a lot to see, and we dove head first into some serious history right away. First stop: Bethlehem. 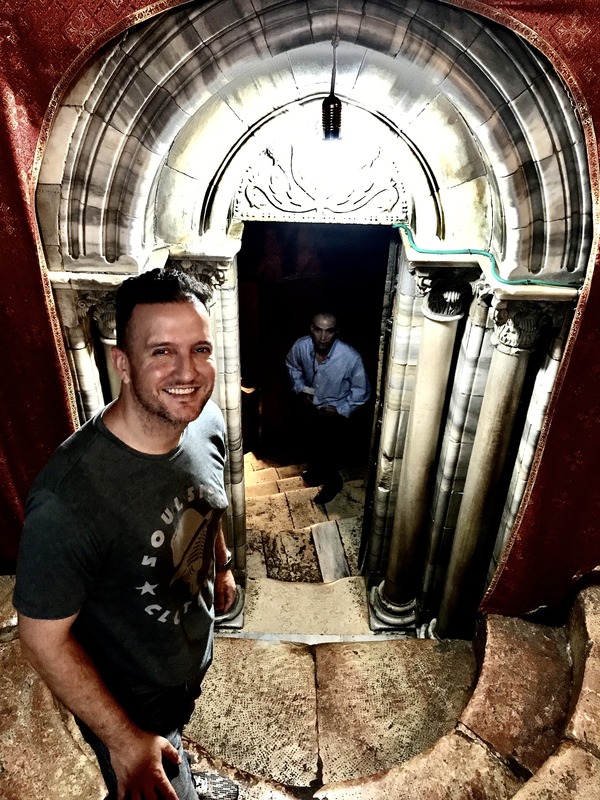 It was hard for me to comprehend that I was actually standing on the spot Jesus was born. The whole thing was just incredible and unreal in so many ways. 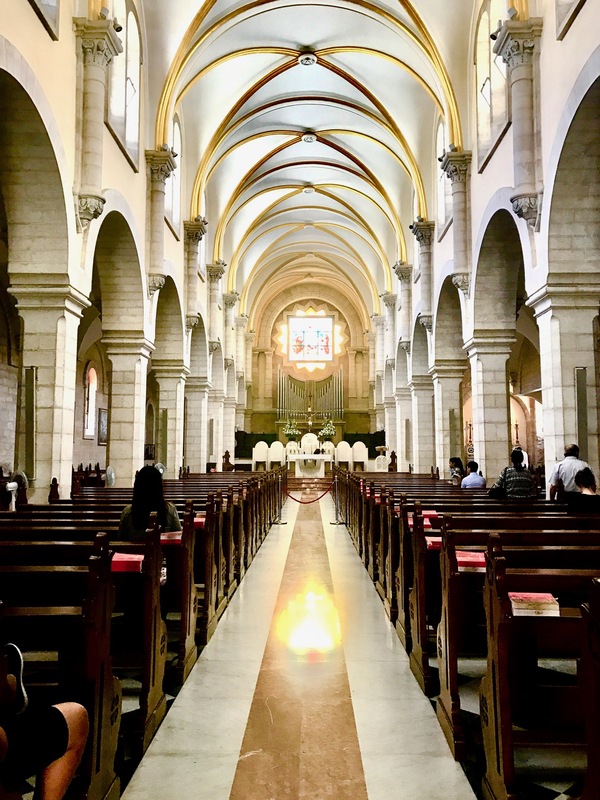 There was a mass going on when I arrived at The Church of Nativity, so I was kind of “smuggled” in by my guide, as he took me from spot to spot–doing our best to keep a low profile and not disturb the service. 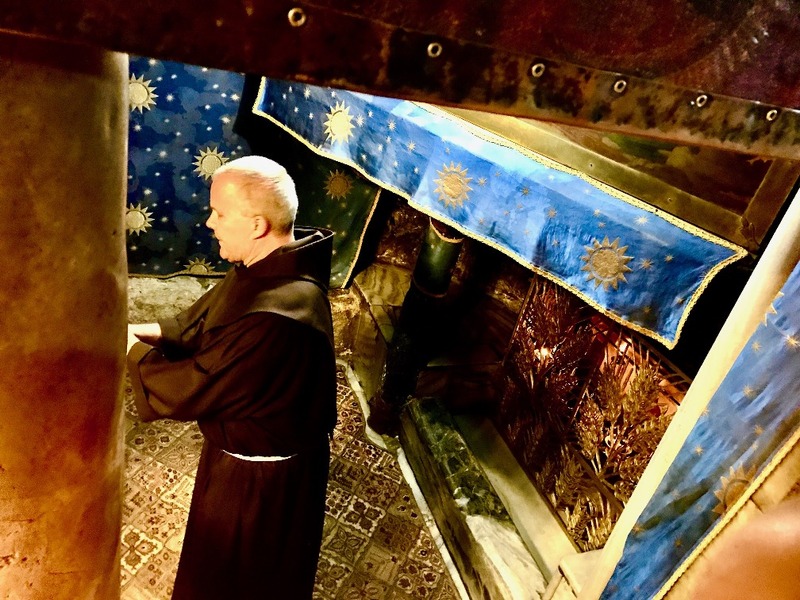 First it was the spot where Jesus was born, then over to the manger, then a look inside the church and out to the courtyard. It happened so fast, but I managed to get a few pictures and say some prayers. The actual manger where the baby Jesus slept. My guide noted that there were different parts of the church for different faiths, which I thought was cool. Even more of a surprise was the giant mosque that lay just feet away from the church Jesus was born. The fact that here the two religions cohabited on the same piece of land was just astonishing to me. The looming, ominous wall of separation. The wall was made of tall, thick concrete, with fences and barbed wire on top and security turrets on the ends. The art on the wall was fascinating. 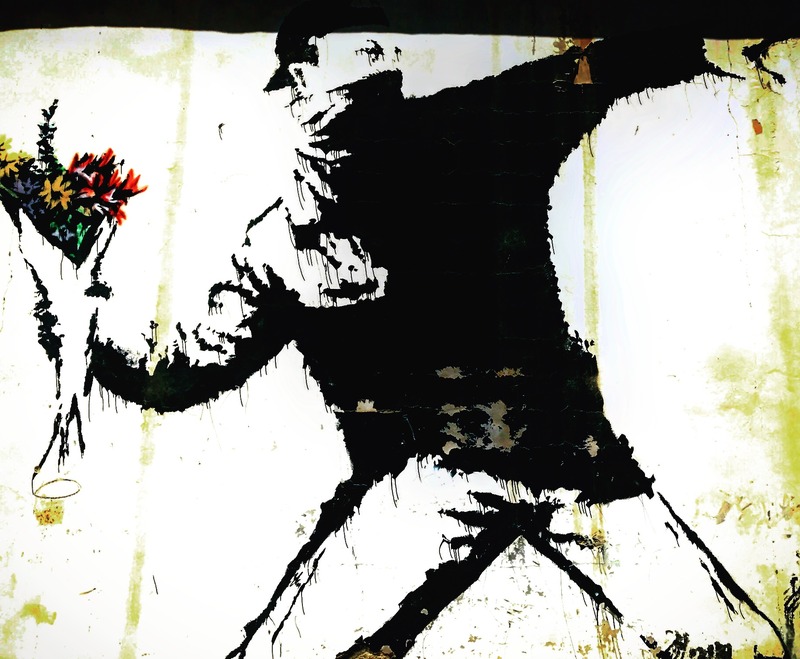 World-renown street artists Banksy had left his mark on various places on the wall, and visitors were invited to leave theirs, too. There was a very cool “graffiti” and “wall-themed” gift shop next to the barrier–that sold souvenirs and also all the supplies one would need to add their artistry to the concrete (paint, stencils, etc.) I enjoyed seeing all the awesome graffiti and reading the political and humorous messages that covered the wall. I was tempted to leave some art myself, but was afraid I’d have nothing intelligent or awe-inspiring to add. This was one of those times in life where it’s better to talk less and listen more. If the art on the wall wasn’t cool enough, it got even cooler, as we approached one of the neatest hotels I’d ever seen. Instead of letting this giant concrete barrier be the demise of an adjacent property, The Walled Off Hotel took advantage of the situation. 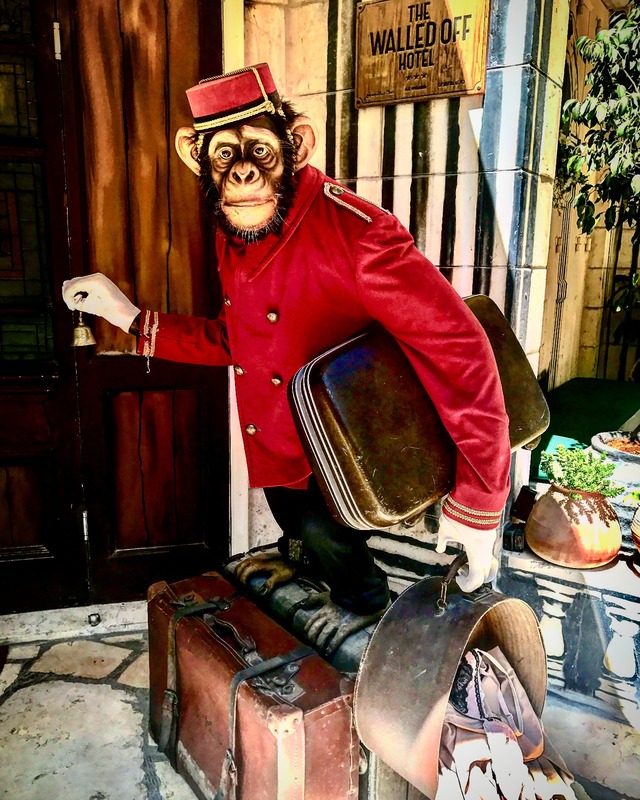 This relatively new border-themed property is part hotel, part museum, part art gallery, and 100% awesome. The lobby and bar look like a hotel out of an Indiana Jones movie. Their drink menu is just as special. But the “education” part of the hotel is what I enjoyed the most. 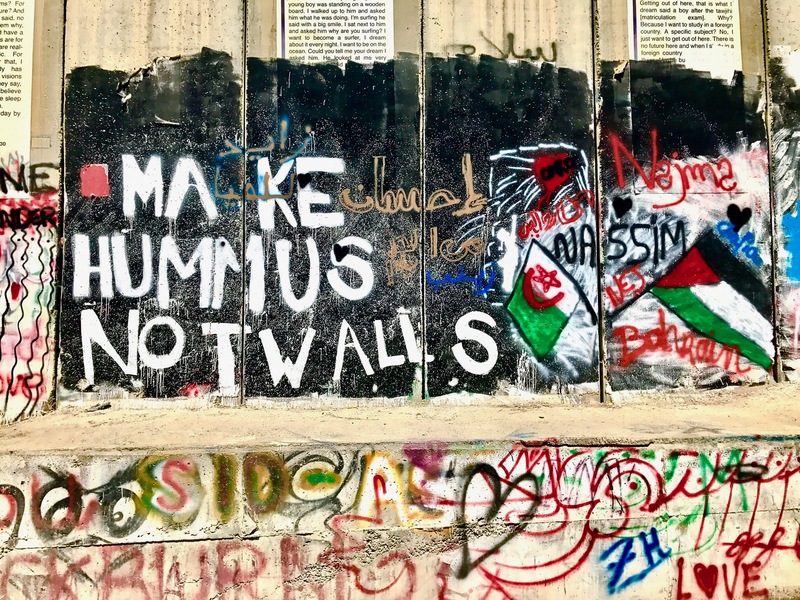 I’m glad I paid a couple bucks to tour their museum, which is an interactive exhibit detailing the history and politics behind “the wall” and Israeli-Palestinian relations. I found it very educational and downright fascinating, and it answered a lot of questions I had; and told some very sad stories of how the wall had effected so many Palestinians (evictions, homes demolished, etc.) Of course this was just one side of the story, and I’m just now starting to educate myself on the topic, so I’m doing my best to reserve judgments until I feel I’m educated enough. A monkey could do this job! 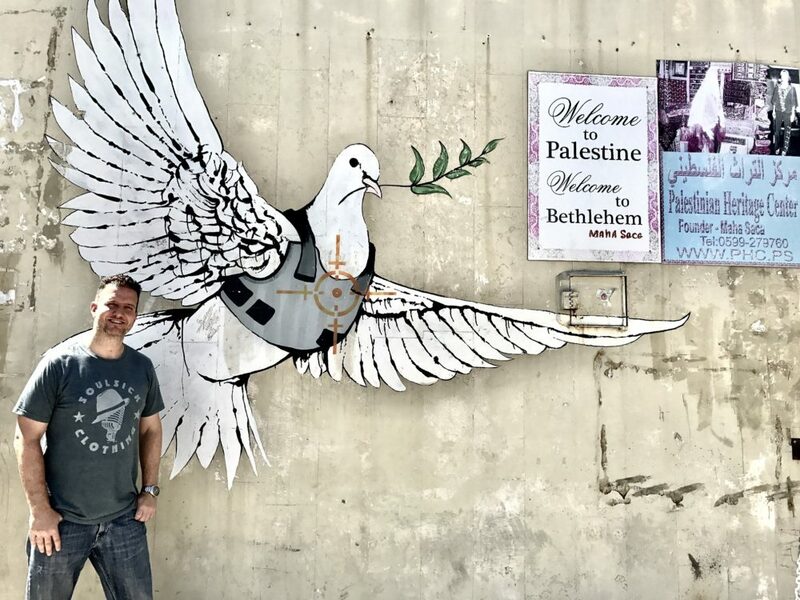 Another Banksy piece…this one was in a more nondescript place: the side of an old car wash.
Next it was on to see the river where Jesus was baptized, but first we stopped to take a look at the world famous Dead Sea. It was cool to see, and we didn’t have any plans to actually swim in it, but once Tamer sensed my excitement about it, he suggested I take a dip. He didn’t have to twist my arm! I had packed trunks for the occasion, so I was ready to go! I paid an admission fee to the park, changed into my swimmies, and in a few minutes my body was bobbing up and down in the saltiest of seas. 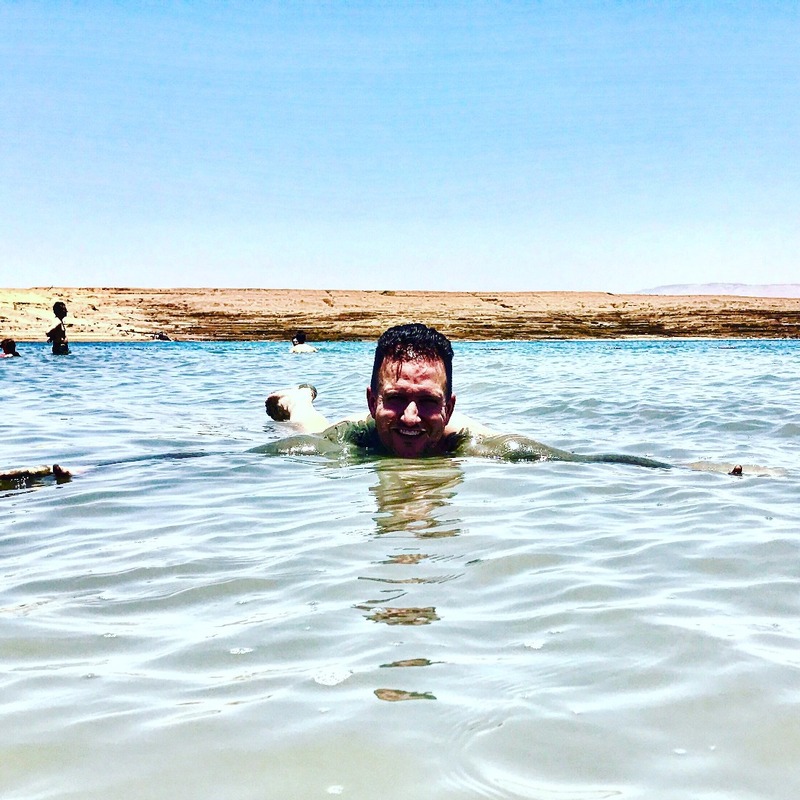 Swimming in the dead sea really was incredible. I’ve always heard that the salinity really makes you weightless in that water, but I didn’t realize just how weightless I’d really be…it was crazy! It was actually difficult to push my feet down into the water; I was bobbing up and down like a cork so much fun! One of the best swims ever! 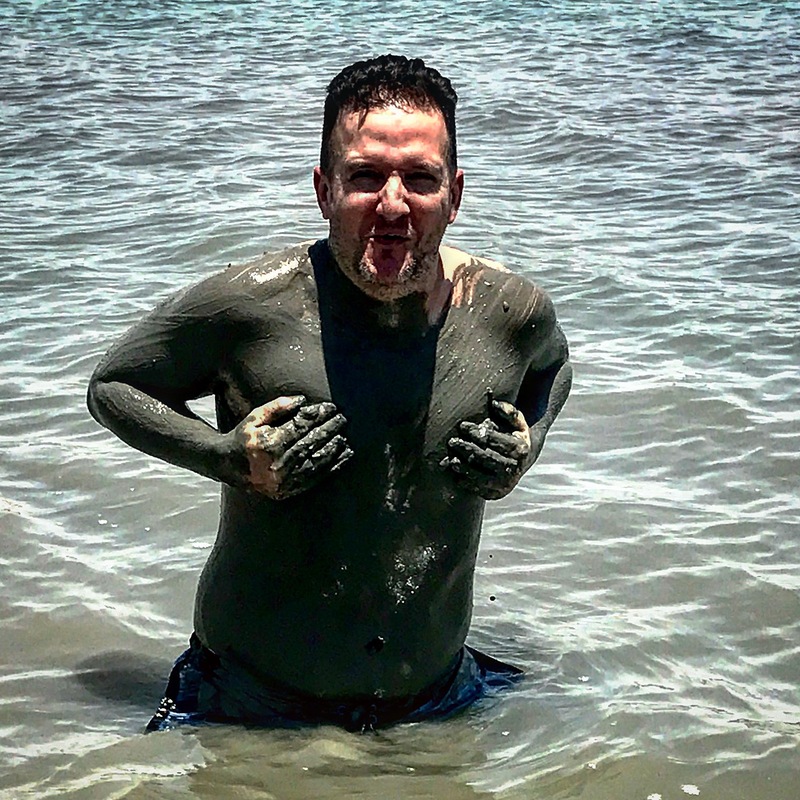 I rubbed the silky black mud all over my pudgy body to enjoy the true Dead Sea experience. Only tough part: it must have been about 115 degrees out; scorching hot. But nonetheless, I was so glad I took the plunge. This is definitely a place I want to come back to when the temperature is cool enough to spend a full day. I hot-footed it back to the locker rooms to shower and change, and then it was on to the next. The adventure continued as the day got hotter. 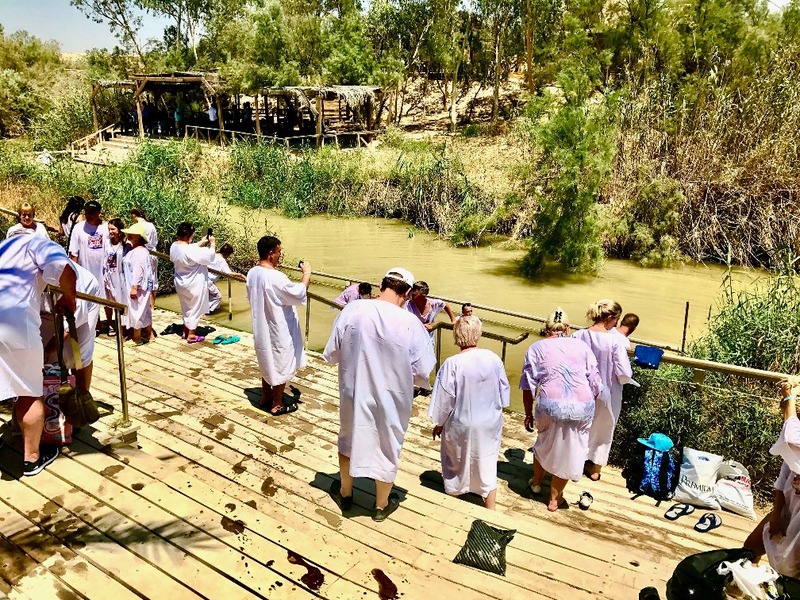 Our next stop was the exact spot in the Jordan River where little baby Jesus was baptized. 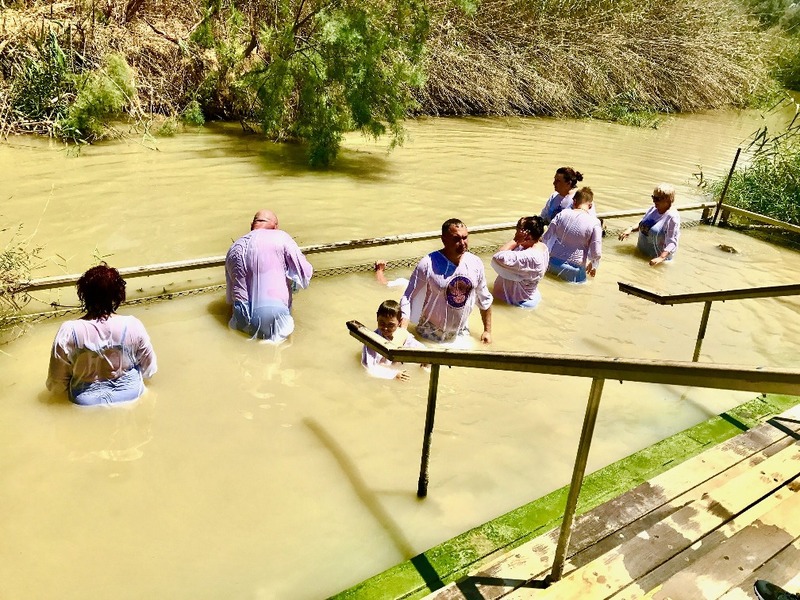 The neatest part: you could slip on a white robe and get baptized there too…how neat would that be! Alas, I’d had enough swim time for the day, so I just looked on, as others bathed in the holy river. 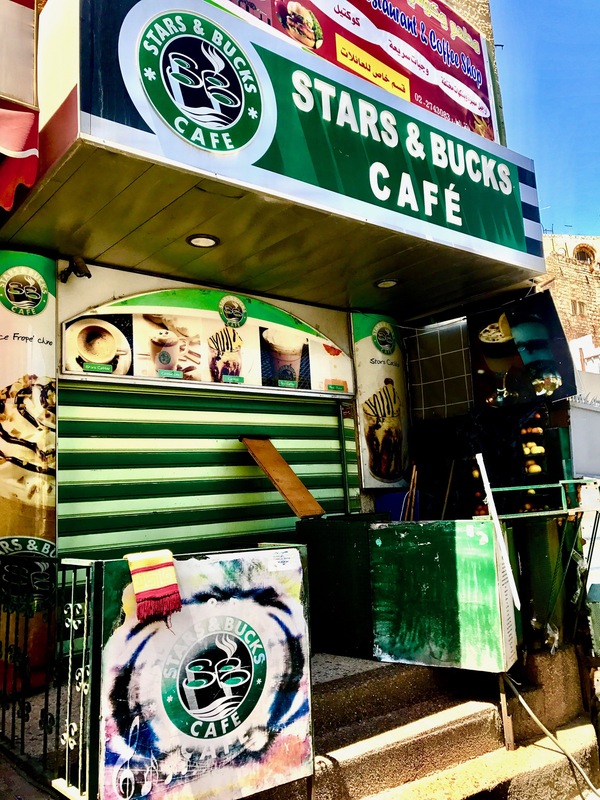 The one thing that really bothered me on this trip was our proximity to Jordan. It was right across that 15-foot wide river…literally, right there!!! And I couldn’t enter. There were soldiers on each side and I would’ve probably been shot, or for sure arrested. It’s not a legal crossing point. 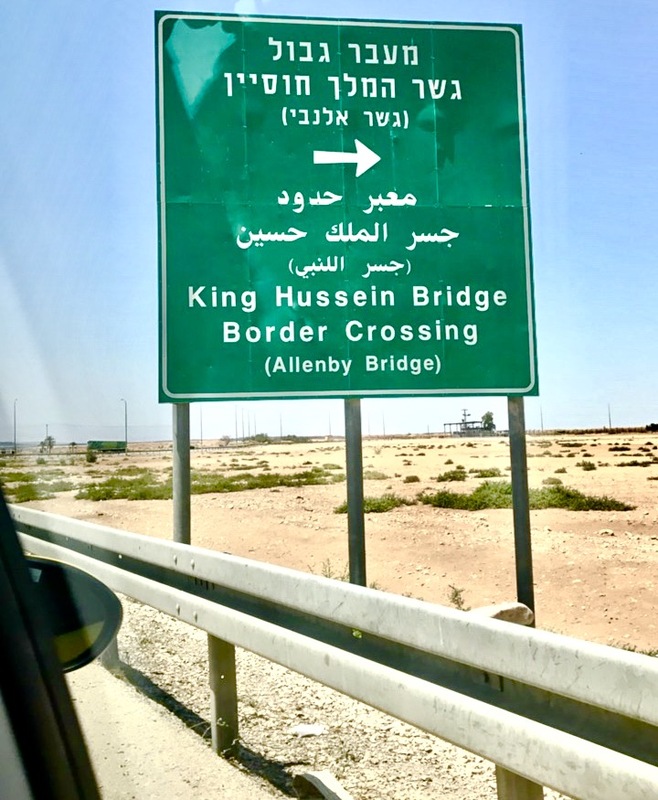 You can cross just a few miles up the road by bridge, but I didn’t have a visa for Jordan, and you couldn’t get one at that particular land crossing. Ugh. So close but so far away. I was seriously bummed about that; I would have loved to have added another pin to my map! Country #90 was thiiiiiiiiiiis close! Here’s the legit crossing to Jordan. I was mad/sad I couldn’t go! 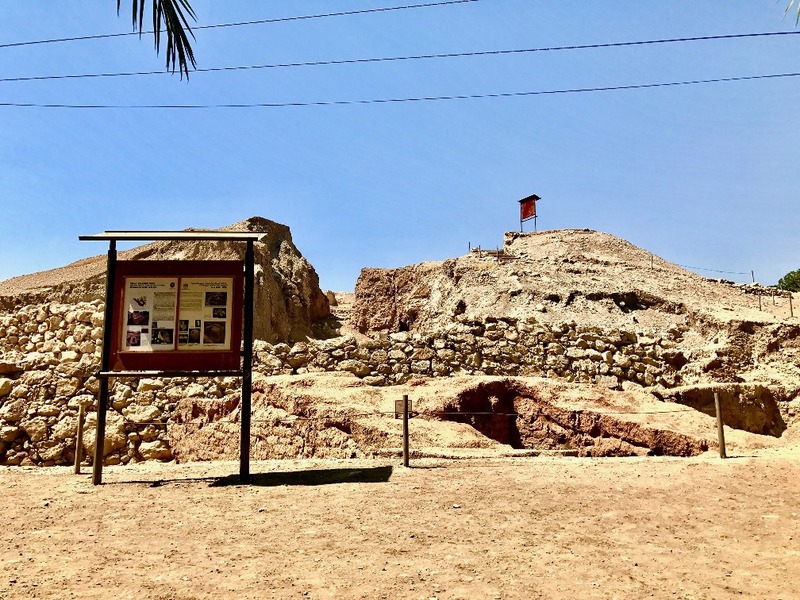 Next stop was the world’s oldest (continuous) city: Jericho. These ruins weren’t much more than heaps of rubble, but considering the town’s age, pretty amazing. Are you ready for it??? 10,000 B.C! Yup! Crazy, right? We toured the grounds but unfortunately by this time it was so hot I felt heat-stroke coming on, and this Arizona native is not a light-weight. It was truly dangerously hot. It was at this moment I’d wished I would had studied the bible more. 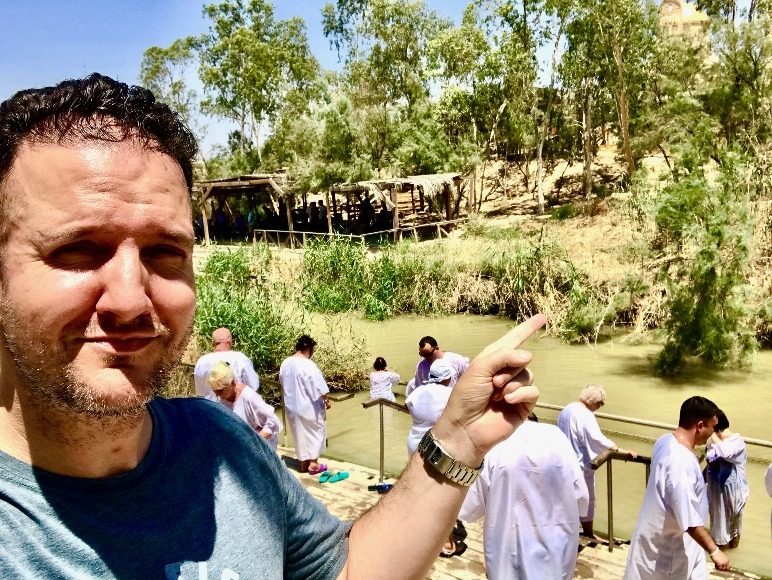 The guide mentioned that so many specific stories in the bible had taken place here, but I couldn’t relate much because I’m just not very experienced bible reader. I felt ashamed, actually. 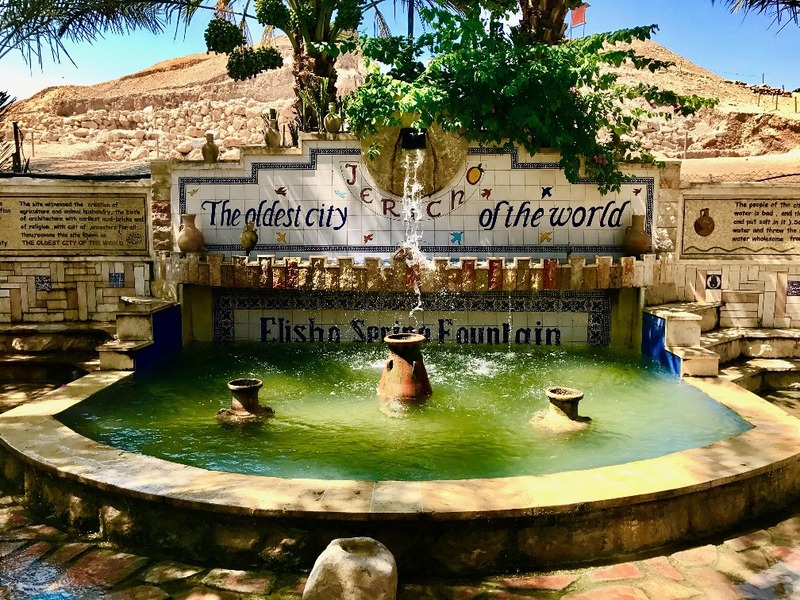 For example, The story of Elisha turning undrinkable water into purified water took place here; and that was long before Brita filters, so apparently this guy was a true miracle worker. 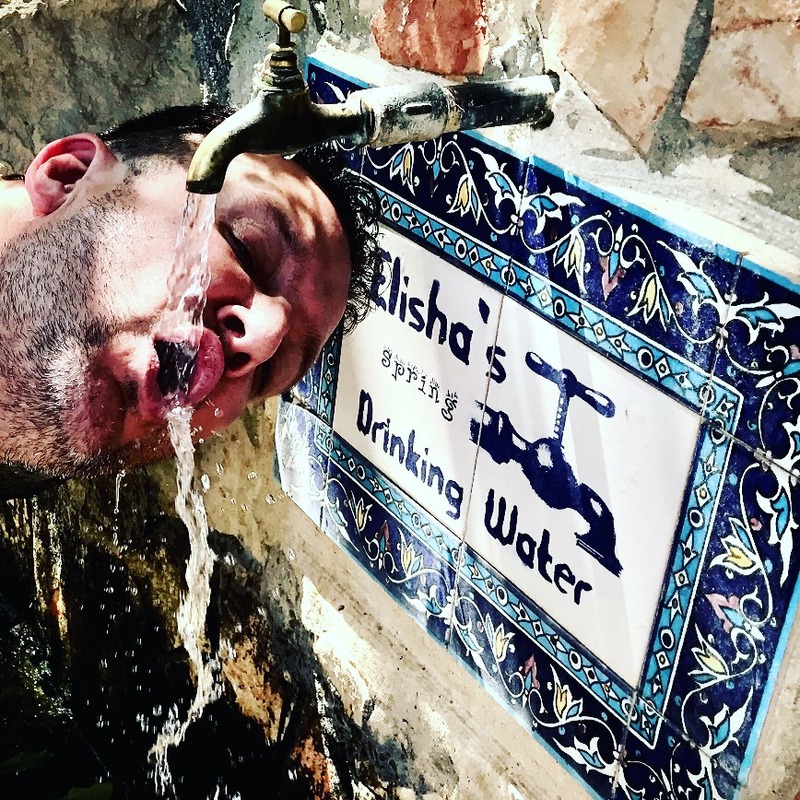 So now getting to actually drink from Elisha’s spring was the highlight of this stop. 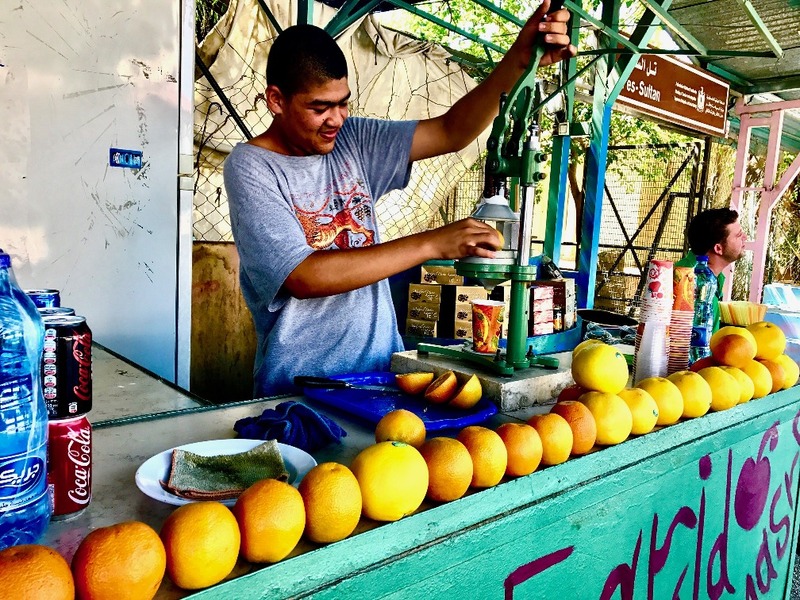 Afterwards, some cold, fresh orange juice helped cool me down. Make me young, make me young, make me young! Last stop, on to the city of Ramallah, where it was a little bit cooler as we winded the busy day down. 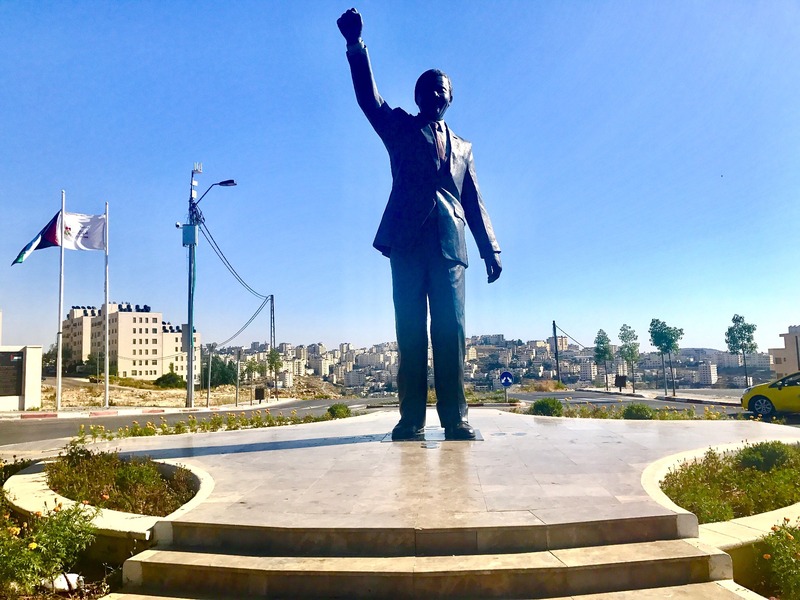 We stopped by a huge Nelson Mandela statue, a funny Starbucks knock-off (that was unfortunately closed), a bite to eat, and then to the Yasser Arafat Memorial. 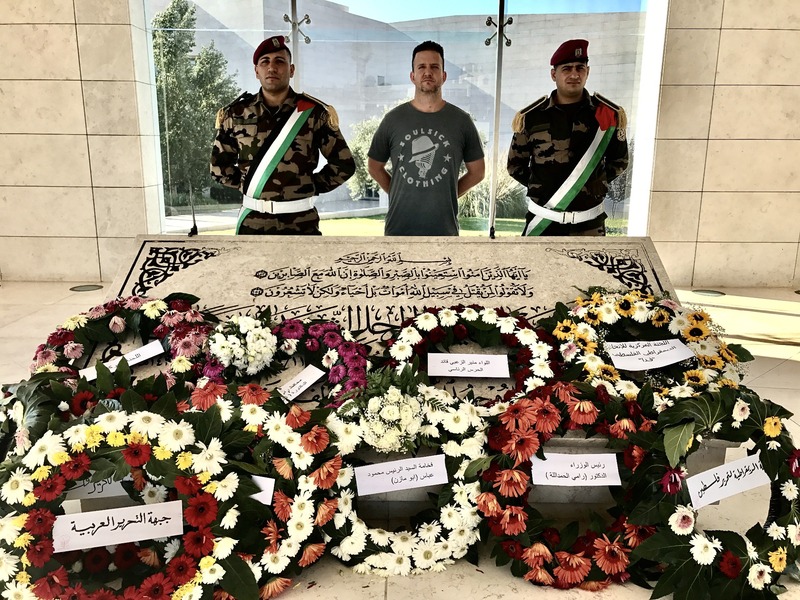 I really enjoyed posing with the soldiers at the Arafat Memorial, mostly, because it’s a rare opportunity when you can take a photo with foreign military. 99.999% of the time it’s strictly forbidden to snap a pic of any military, so this was a treat; the best souvenir I could ask for. Our driver Mohammand, me, Tamer. Thank you my brother!!! 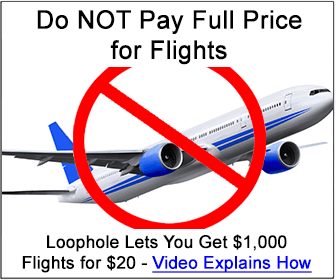 I was checking out your Venezuela videos yesterday! You definitely would have had a better appreciation of this trip to Israel had you had a high level understanding of the history of this part of the world. 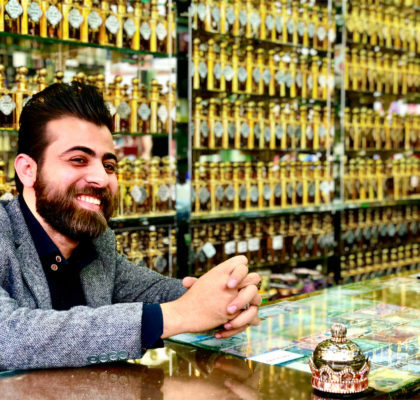 It’s a very long and complicated history between the Jews and Palestinians that has also shaped the way geopolitics works in the Middle East today. The Land of Israel has been inhabited for tens of thousands of years dating back to the times of Neanderthals while seeing many different Empires come and go since the founding of Jericho, such as the Egyptians, the Roman Empire and the Ottoman Empire. Around 70 AD, the Roman Empire expelled the Jews from Jerusalem after a revolt. This is what essentially caused a mass exodus of the Jews to other parts of the world, but mainly to Europe. During the late 19th Century, Zionism was founded in response to Antisemitism the Jews had experienced in Europe during the Industrial Revolution although Zionists will say that Antisemitism within Europe goes as far back as the Roman Empire days. The founders of Zionism believed the Jews should return to their homeland (aka “the Land of Israel”) as it was their right to do so. 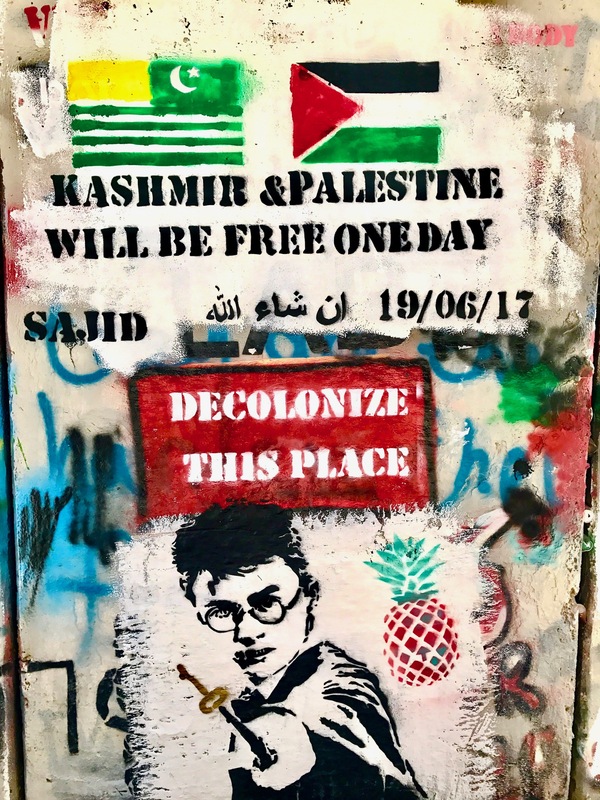 Meanwhile, Israel was known as the Palestinian Territory around this time and was administered by Britain after World War 1 once the Ottoman Empire collapsed. Nothing much came about with Zionism until the end of the Second World War. After the atrocities of the Holocaust were discovered by the Allies after the demise of Hitler, Zionism quickly gained support, especially from both the American and French Governments, while the British were more hesitant about an Arab Revolt. This is where things start to get complicated. The UN proposed that Israel be divided into a two State system – a Jewish state and an Arab state. The State of Israel was then founded in 1948. In theory, the idea was that both Israelis and Palestinians could live in peaceful harmony in a two-state system. In practice, though, it has yet to materialize. Zionists believe that Israel is rightfully theirs and that that they are just reclaiming the land they were given a couple Millennia earlier. Arab Nationalists, on the other hand, will tell you that they are just defending themselves from the apartheid system that the Israeli government has forced upon them as you kind of noticed in your observations mentioned above. This is where groups, like Hamas, come into play as they will defend themselves by all means necessary, including acts of terrorism. About the only thing Arab Nationalists and Zionists can agree on is that Israel should not be a two-state system. Israel has also been involved in several disputes with its neighbours since it’s creation. This is where you should read up on events like the Six Days War, Golan Heights and Lebanese-Israeli relations. Egypt and Jordan are the only two countries at the moment that have established peace treaties with Israel. Lebanon, Syria, Sudan, Iraq, Iran, Algeria and Libya will deny entry to any visitors with an Israeli stamp in their passport and all Israeli citizens. 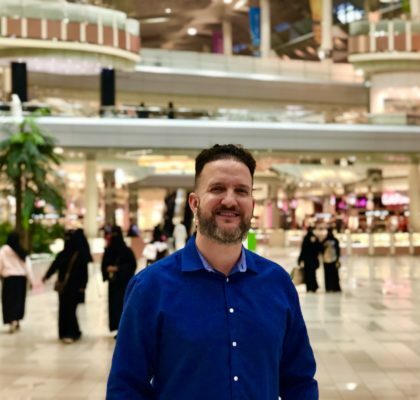 You will also want to read up on the policies about the Gulf States, like Qatar, Bahrain, and Kuwait as I am not 100% certain if they have these strict Visa restrictions, as well. The best thing to do as a visitor is to not choose sides and just listen rather than state your opinions, like you did. But I could only imagine what it would be like walking around Israel in an alternate timeline where Hitler never took over Germany and the Holocaust never happened. Would Zionists still have gotten support from the United States to create the State of Israel? 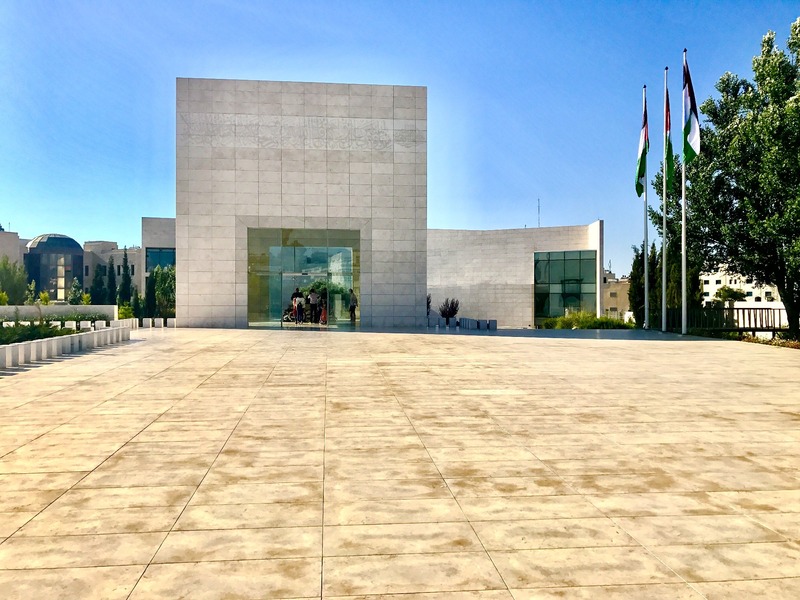 Or would you have visited an alternate Palestine state similar to Jordan where the country seems to embrace a moderate approach to Islamic governance? Or would it have followed suit with its neighbours, like Iran and Saudi Arabia, instead? Unfortunately, we’ll never know.